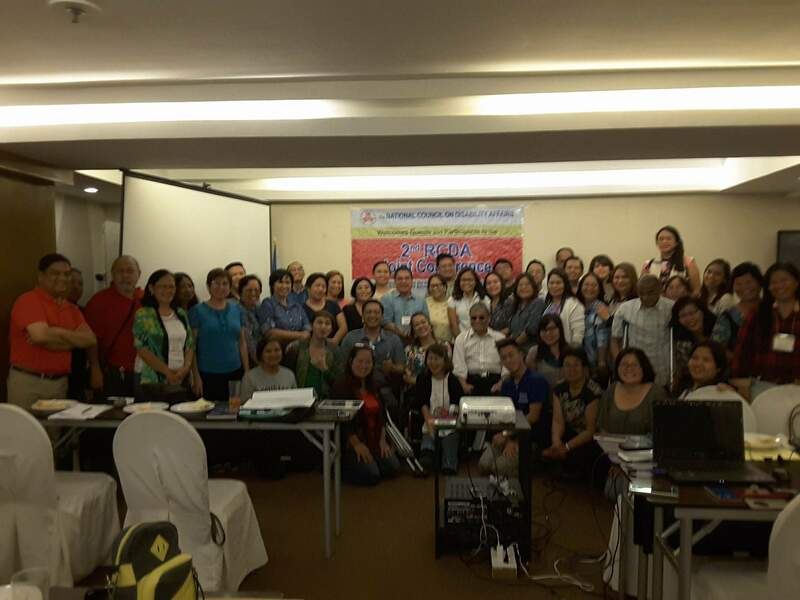 The National Council on Disability Affairs conducted the “2nd Joint Conference of the Regional Committees on Disability Affairs” held in St. Mark’s Hotel, Cebu City last April 25-29, 2016. It was participated by around 100 participants representing two (2) clusters: the Visayas regions V, VI, VII, VIII, Negros Island Region including National Capital Region, and the Mindanao regions IX, X, XI, XII, CARAGA and ARMM. In line with the theme “Enabling RCDAs as the Gateway to the Local Government Units (LGUs) for Programs and Services for Persons with Disabilities”, this year’s RCDA Joint Conference focuses on the Regional Reporting Template System or RRTS, a structured automated program reporting system designed to capture regional reports from RCDA member agencies, a tool designed to assist the RCDA member agencies in submission/preparation of reports and in the generation and collection of disability data as basis for policy formulation and program development. Dir Zubiaga also enjoined the participants to be more realistic in coming up with projects and services which are beneficial to persons with disabilities at the local level. “The regions should know the needs and how to provide the right assistance to persons with disabilities such as the proper assessment of wheelchairs appropriate to the individual with disability.”, she emphasized. In the same occasion, DSWD Regional Director Evelyn B. Macapobre who also chairs the RCDA VII, emphasized the importance of data on persons with disabilities in influencing the LGUs to craft programs and services for the sector, and in knowing available services at the national level which could be availed of by persons with disabilities to really be the “gateway” to LGUs for programs/services for the sector. She challenged the participants to influence the LGUs, and to aggressively promote disability prevention and early intervention. She also expressed hope that the next Administration will support the “Sustainable Development Goals” which include some provisions concerning persons with disabilities. NCDA Deputy Executive Director Mateo A. Lee, Jr. who led in designing the RRTS, responded to the inquiries of the participants during the “Q & A” part of the Conference proper, along with Director Zubiaga.